CLICK is a theme-based monthly food photography event started by Jai and Bee of Jugalbandi. The theme for October 2007 is the incredibly versatile and popular Egg. ...before deciding to pick this one as my entry. This is how the eggs were used the next day...in a simple and delicious egg curry. 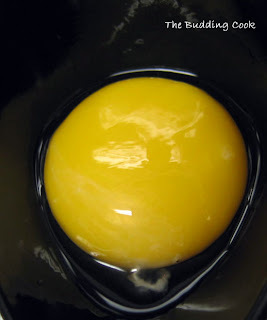 The yolk was used to make an omelette. Heat oil in a pan & add the cumin seeds. Next, add the ginger-garlic paste followed by the green chillies and chopped onions. Sauté till the onions turn transparent. Add the chopped tomatoes and cover and cook till the tomatoes are done and turn mushy. Allow this to cool for a bit & then blend the onion-tomato mixture well to get a smooth paste/sauce. Make small slits in the hard-boiled eggs and drop into the gravy. Cover and cook for another 5- 7 minutes to allow all the flavors to blend in. Turn off the heat and garnish with chopped coriander leaves. Serve hot with rotis or rice. All the egg pics look really really good , especially the first one. Egg curry looks yummy too. Thanks for sharing this recipe. Beautiful click. egg curry looks delicious. thanks for your beautiful entry. see you at the roundup. Eggcelent Pictures and lovely recipe too! Nice Egg pic TBC:) and so's the egg curry...I usually add some coconut milk to my curry. Love Motta curry! !Any time of the day with any main food! !Bcoz it goes well with almost anything!! By the way didnt you want to change the banana friitters(JFI) to the fruit category????? The neon eggs look gorgeous!! 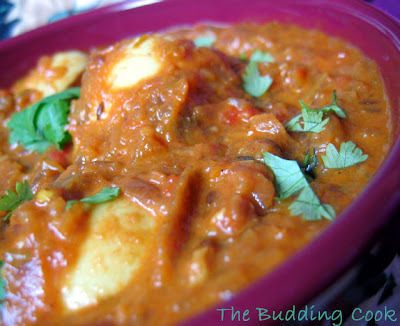 And egg curry looks really sumptuous! that egg dish with garam masala such give me a good appetite. Cool pics, Delicious curry, mouth watering!!! Beautiful pics!, and the egg curry ,yum!! This sounds wonderful! Thanks so much. Nice pictures! I liked the one you are sending for the event...looks beautiful! Egg curry also looks rich and delish! Fabulous pics TBC, loved you entry and especially loved the yolk, looks so yellow and I feel like poking it right through the pic..hehe!Good job and lovely Egg curry recipe..
Beautiful shots, TBC. I would pick the last one, too, as my entry. 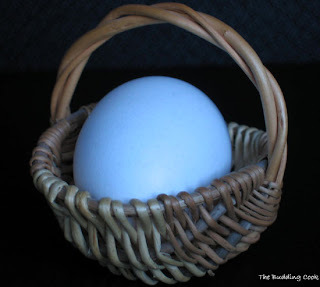 Blue is a lovely color for an egg, whether as nature intended or with a little help from its human friends. I cannot say much about the curry as I do not eat eggs, but the photos are stunning. 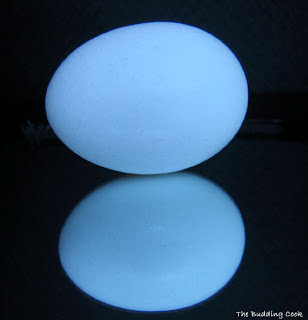 The entry photo is really nicely taken, was wondering did u take it during the night or in shadow, loved the blue tint on the egg! I loved the first snap! Lovely photo of the egg curry. Thanks for the recipe. Its simple and instant for a curry. *love* your Click entry - simple and effective! I like your entry picture. very nice! nice snap, tbc..and egg curry..esp with Appam..my ever facvourite!!! the pictures are really nice. a very tasty egg curry indeed! thanks for visiting my blog! I love the reflective pictures. And the recipe looks even better! Your lighting is amazing! It appears as if it is floating mid-space, and you are not quite sure which one is real, which is the reflection. That's a beautiful shot of an egg! And I love egg curry, yum! I like the one with the reflection that you picked for the entry. Kribha, Seena, Daily Meals, Prajusha, Click, Neelam, Mansi,Sreelu, Sra, Bharathy, Musical, Apple, Rachna, Happy Cook, Asha, Big Boys Oven, Rina, Rajitha, Bindiya, Sam, Tee, Laavanya, Namratha, Susan, Patricia, Hima, Padma, Latha, Dhivya, Bhags, Ani, Sirisha, Kaykat, Dwiana, Lakshmi, Roopa, Sona, Lissie, Supriya, Deborah, Sivani, Cris, Tigerfish, Swaroopa, Sia, Grihini and Cynthia-Thank you so much for taking the time out to stop by and leave your comments here. I really appreciate the feedback and words of encouragement from each and every one of you. I am sorry I am unable to respond to each one of you individually since I have been a little busy. Rajitha- awww, you are so sweet to check on me:-)Everything's fine, just busy with work & stuff. Oh I haven't heard of that event. I'll have to check it out. I love the "click" you chose! Very cool reflection. Kristen- do check it out. You take beautiful pictures anyway, so it should be real easy for you to come up with a good one for next time. 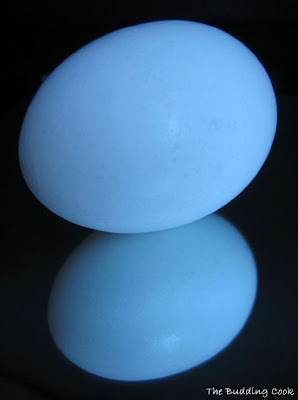 hey such wonderful photos of the egg! Do let me know how you like it if u do make it.